Of all the card tricks out there, if you have a young budding magician, this is probably the best card magic trick to teach him or her. It’s a basic “find a card” trick that’s easy to learn and perform and the secret is simple to understand. The "find a card" plot where a magician has a card selected and lost in the deck and then finds it is probably the best known card magic trick out there. The method taught here will allow a young kid, perhaps as young as five, to perform the trick. 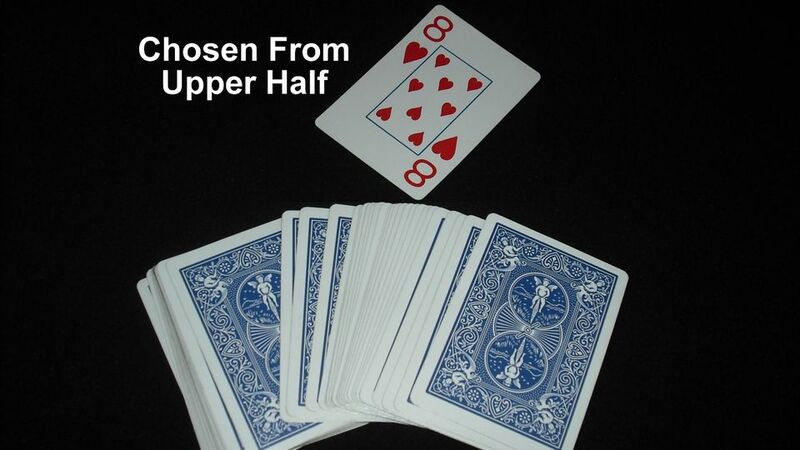 If that little Houdini knows and can recognize the different cards, they can do this one. And even if you aren’t a little kid, you can have fun with this one. It this trick, the magician allows a spectator to randomly select a card and then, through some mysterious means, finds it after it’s been mixed back into the deck. Go to the next page to learn the secret. Here’s the secret to this card magic trick. You’re placing all of the black playing cards (clubs and spades) in the lower half of the deck and all of the red cards (diamonds and hearts) in the upper half. The spectator selects a card from the upper half, which will be an red card, and then replaces it in the lower half, which consists of black cards. When you need to find the card, all you have to do is look through the deck and find the single red card among the black cards. You will need to set the order of the deck. Beforehand, deal the cards face-up onto the table and place all of the black cards (clubs and spades) in one pile and all of the red cards (diamonds and hearts) into a second pile. Put the deck back together with the black cards on the bottom and the red cards on the top. If you spread through the deck face up you’ll notice that all of the black cards will be in the right hand side of the deck and all of the red cards in the left hand side. You’re ready to perform the trick. Present the deck of cards and ask the spectator to select a card. Make sure that he selects the card from the top half of the deck, which will ensure that he will take a red card. In our example in the picture, the spectator has selected the eight of hearts. After the spectator looks at the card and shows it to others, ask him to replace it. At this point, offer the spectator the lower half of the deck. You can accomplish this by spreading the deck face down to accept the card and opening wide the lower section with the black cards. This ensures that the spectator will place his red card among the black ones. Now it’s time to “magically” locate the chosen card. Simply spread the deck towards you and look through the lower half, and you should be able to immediately see the one red card among the black cards. At this point, you can simply bring out the spectator’s card to show that you have somehow found it. Remember as you look through the cards to be sure that the cards are facing you and that the spectators can't see the cards. Otherwise, they'll figure out what's going on and the gig will be up. The trick is far more baffling if you can perform a shuffle or mix of the cards before you find the card. In the spectator’s mind, the card will be lost in the deck. You’ll find one such technique, called a "false cut" that you can learn here. Another suggestion, instead of simply finding the card by looking through the deck and then showing it to the spectator, it’s more impressive and fun if you perform one of our card magic trick revelations or a theme. For example, you can pretend to "smell" the cards and try and locate a spectator's scent on it. This is great for kids as it's quite comical for a kid to pretend to smell a person and then "smell" the cards to locate it. You can also pretend to "look" for fingerprints to determine the card that the spectator selected. Bring out a huge magnifying glass and it will add some comedy to the routine. You can also consider adding a fun card revelation that can include the rising card (learn version one and then learn version two). With these card revelations, you’ll not only identify and find your spectator’s chosen card, you’ll be able to make it mysteriously rise out of the deck. Remember that it's the presentation that makes a trick fun. This card trick may have a very simple secret, but presented well, it can be quite entertaining.